Legislation sponsored by Rep. Sue Helm (R-Dauphin) was signed into law Friday by Gov. Tom Corbett. House Bill 442 bans private transfer fees in real estate transactions. A consumer protection bill sponsored by Rep. Sue Helm (R-Dauphin) today was signed into law by Gov. Tom Corbett. 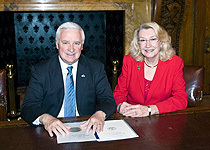 Helm took part in the bill-signing ceremony held in the Governor’s Reception Room at the State Capitol, along with representatives from Pennsylvania’s real estate industry. House Bill 442 gives home buyers added protection during the purchase process. The new law prohibits the charging of private transfer fees in real estate transactions and requires disclosure of existing private transfer fees. Private transfer fees were written into purchase contracts and levied based on a percentage of the final sale price each time a property changed hands. A typical private transfer fee was 1 percent and remained in place for 99 years. As a result, unsuspecting homeowners were often forced to pay thousands of dollars in additional closing costs. House Bill 442 takes effect immediately. Pennsylvania is now the 28th state to prohibit private transfer fees. Helm’s legislation was supported by the Pennsylvania Association of REALTORS.